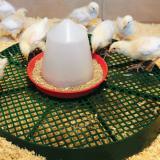 We never had a chick stands but will never be without one. It's just nice for keeping the food cleaning up out of the bedding. The chick stand did a great job keeping the water clean. 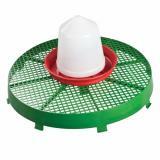 We used this for our ducklings who are professional splashers. I wish Premier sold a reservoir to catch the water in. The closest I found was a 20" plant saucer. This kept the the bedding dry. 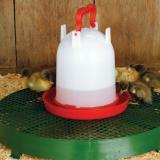 Still a far cry from the messes we have had in the past with ducks. Love it! I bought two and use both for water. I put the water over the hole. It needs to be big like it is to be as functional. I used to put the chick water on a board or flat rock, but nothing as large as this, and they would still get the water full of shavings. I do wish it was made of more durable material, it feels a little flimsy and after 2 weeks, one of the two that I have has a small crack in it. 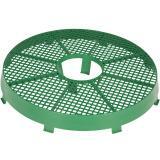 I hope they last a decent amount of time because they are a very useful product. I wish I knew about this product sooner! 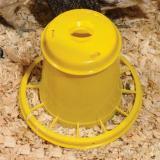 I have tried several different ways to keep my chick’s food and water clean with no success. 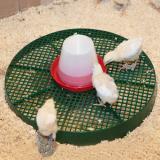 The chick stand does a perfect job of keeping everything clean. My only regret is that I didn’t pay too much attention to the dimensions so I ordered two of them thinking they were smaller. I was a little surprised to see it was so big. This is an awesome idea. 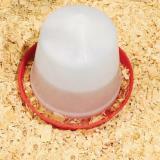 It helps to keep the pine shavings out of the food and water dishes. Be aware they are rather large. I’d like to see some smaller options and remove the hole for the feeder dish. 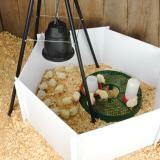 Also add some square designs to accommodate different brooders.